Celebrate the joy of spring when you deliver Easter greetings via this cheerful 9¼"x3¾" panoramic card. Decked out in their Easter best, a procession of happy creatures—a drum-playing rabbit, a parasol-wielding chicken, a fluffy white lamb, a pretty bunny in an Easter-egg carriage—parade beneath a "Happy Easter" banner. And when you pull the tab, the animals really march! 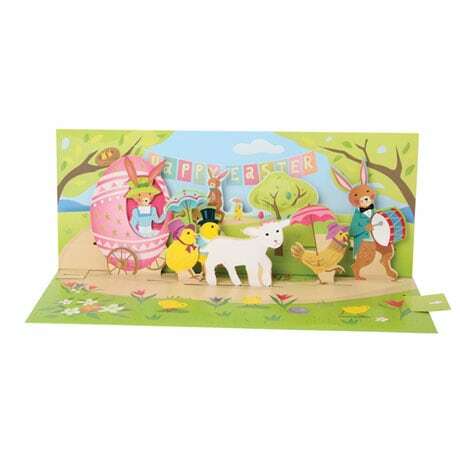 With space on the back to write your personal Easter greetings and a special tab to prop the card open for display, our Easter Parade Pop-Up Card is sure to please your little bunny. Envelope included; extra postage required.